Curiel International Logistics is a leading International Transportation provider NVOCC & IAC Licensed, thanks to our excellent team of professionals and our state of the art operating systems. We provide high quality, complete transportation services, reflecting our years of experience in the ocean, air and ground transportation industries. Our Headquarters located in the NY/NJ area, and branch in Miami, where we operate a full service warehouse, handling both full containers and Ocean/Air consolidations. Curiel International Logistics offers complete warehousing and transportation services, handling cargo from its point of origin to its final destination. 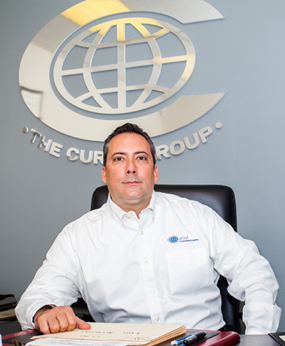 Cesar Curiel, CURIEL INTERNATIONAL LOGISTICS President, is a former US Army Sergeant who brings his Army values to all aspects of the operation. "We stress loyalty, honor, respect, responsibility and integrity in our day to day operations. They are the cornerstones of our success both as individuals and as a company." In addition to his Army experience, Cesar has an extensive background in the Transportation industry, working with such firms as King Ocean (Vzla), Aerocentro de Servicios (Vzla.) and Universal Freightways (USA). His associations in the industry enable CIL to offer clients options and solutions to fit their individual needs. To be a leader in the field of Transportation, recognized as a company with integrity that offers a complete range of services, allowing us to meet each client's needs: locating and purchasing merchandise or equipment, arranging transportation and providing all documentation required for Import/Export, offering our clients the benefit of our experience in the global market with efficiency, quality, agility and reliability. For Curiel International Logistics to be a global leader in transportation and logistics operating with the highest ethical standards while exercising social responsibility and respect for our environment. Team Work: We value each and every member of our team and all they bring to our organization. We would not be where we are without them. Honesty: In all aspects of our operations and within each member of our team, honesty is the platform for all negotiations and relationships, between one another, our vendors and our clients. Responsibility: A commitment to fulfilling our client's expectations, with attention to each client's individual needs and concerns, resulting in the best and most reliable service in the industry. Operational Excellence: We employ the latest technology and training in our operations and seek industry innovations that will enhance our service. Excellence: Our service will be unrivaled in the industry, thanks to the high standards and talent of each member of our team. Loyalty: Keeping the best interests of our clients above all else. Goal: To exceed each client's expectations. We want our clients to be so satisfied that we will be the first NVOCC they think of and recommend us to others. Respect: A foundation of our value system is treating our clients and vendors with the highest consideration and respect. Diligence and Perseverance: We will respond promptly to all of our clients, working tirelessly to satisfy every request and meet every deadline. Adaptability: We foster an atmosphere of thinking outside the box, allowing us to make what may seem impossible possible for our clients. Commitment: To understand and exceed our customer's needs and expectations.